I was able to experience my 1st Kenyan wedding yesterday! It was a lot of fun, and SO different than American weddings. First of all, the bride and groom have actually already been married for about 10 years, and they have two children. They just never had a ceremony. They recently decided they wanted to have an actual wedding in the church, and celebrate with friends. The wedding was supposed to start at 10:30am. I got there at 10:15 and not one person was in the church. The first guest (besides myself) came at about 11:30. The wedding didn’t actually start until around 12. 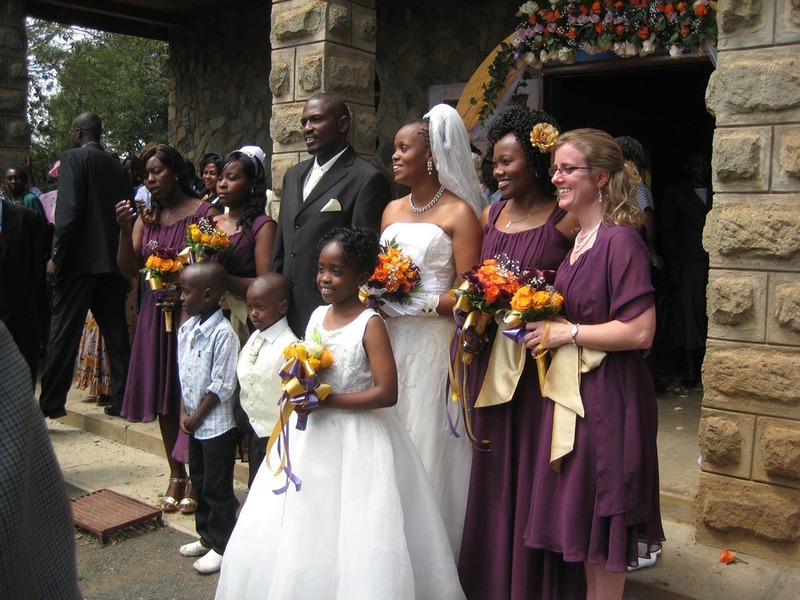 Although, I think that is pretty good for a Kenyan wedding, I have heard they can be 3 or 4 hours late getting started! 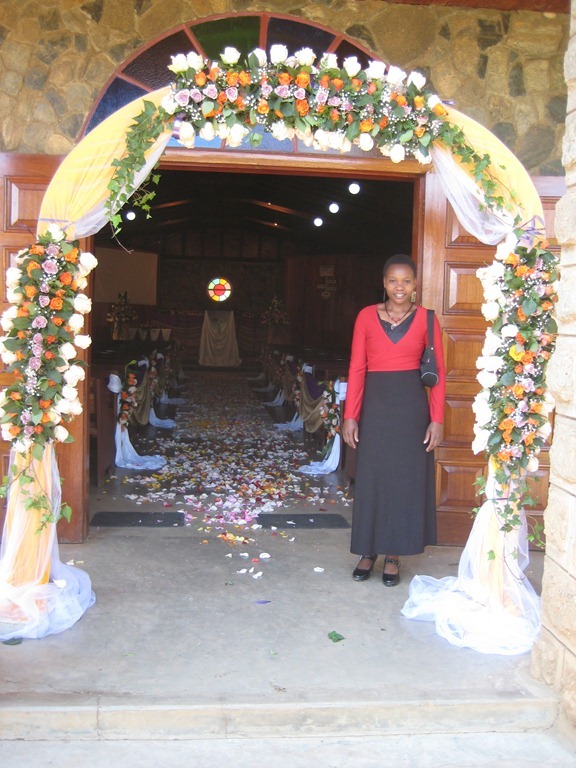 The church decorated beautifully for the wedding, and my friend Esther. When I looked at my watch at about 11, I was afraid there were going to be no guests. But once the wedding started, I turned around in my seat and people were packed into this church! Seriously, there were rows of people standing at the back, it was amazing how so many of them showed up all at the same time. It was definitely not as organized as American weddings. It seemed like they were planning it as they were going. Ha. But yet that didn’t make it bad, it was just different. And people talked throughout the whole thing. As the bride was walking down the aisle, I heard so much noise, which I was not used to. The bridesmaids would be their groomsmen they were partnered with halfway down the aisle. They walked to each other, he presented her with flowers, and they walked to the front together. I am an emotional girl. And I have ALWAYS cried at weddings. Especially when the bride walks down the aisle. Even though it was much different than what I am used to, I still managed to tear up when I saw her coming. 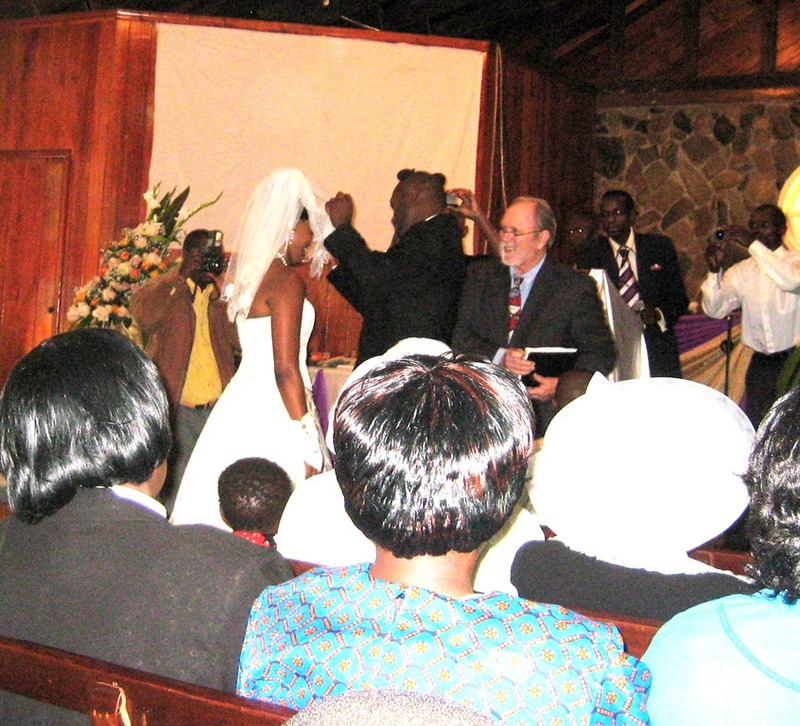 This Kenyan wedding had the same effect on me. The groom “unveiling” his bride. I think this is the equivalent to “kissing the bride,” because they didn’t do that, and this part was pretty exciting to the audience. After the wedding, we hitched a ride to the reception. The reception site was fantastic!! They had two long rows of tents set up, and one in the middle for the bridal party. The bride & groom, and the bridesmaids. There was a ton of dancing! Honestly, the dancing made me really nervous! When I first got there, the DJ saw me and said (in the microphone in front of everyone may I add…), “Hello mzungu, I salute you!” Ha, he was just being funny, but I was so afraid he was going to call me out there to dance! Anyway, he didn’t, but it was really entertaining to watch everyone else dance! I left to walk home at about 3:30, and I was totally exhausted. I am not sure if it was the hot African sun that wore me out, or being at a wedding for 5 hours. But, I heard from someone that they went home at 10:30 pm, and it wasn’t even over! That is one long wedding! I have uploaded some videos from the wedding so you can see some of what I am talking about. To see more pictures, check out our Facebook album from the wedding.